THE UNITED STATES Air Force and Navy has provided a visual insight into what caused the 9.0 magnitude off of Japan on March 11, 2011 at 05:46:23 UTC. The image above was downloaded from the High Frequency Active Auroral Research Program (HAARP*) website. It is a time-frequency spectrogram, which shows the frequency content of signals recorded by the HAARP Induction Magnetometer. This instrument, provided by the University of Tokyo, measures temporal variations in the geomagnetic field (Earth’s magnetosphere) in the ULF (ultra-low frequency) range of 0-5 Hz. Notions have been added to the image to show you what was happening the day the Japan earthquake and tsunami struck. If you go to HAARP’s official website you can see for yourself that the 2.5 Hz ULF frequency wasn’t only being broadcated for 10 hours, it was constantly being broadcasted for 2 days prior to the earthquake. Broadcasting began on March 8, 2011, just before midnight as you can see on HAARP’s website page. Click on the Next Day link to see that the earthquake inducing 2.5 Hz ULF frequency was being broadcasted for the entire days of March 9, 2011 and March 10, 2011. Even though the signature frequency of an earthquake was shown throughout March 9 and March 10 there were no constant earthquakes occurring off the east coast of Japan. 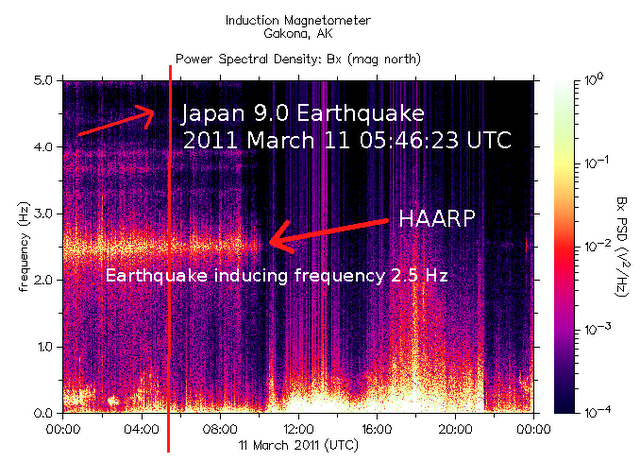 The HAARP magnetometer data provides proof that the Japan earthquake was not a naturally occurring quake – it was triggered. 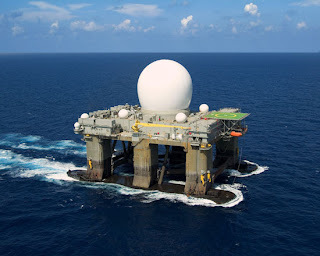 This data shows us that a HAARP military installation was broadcasting the known earthquake signature frequency in order to trigger a major earthquake. 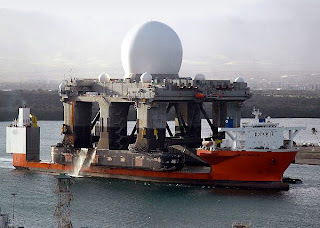 The broadcast was most likely being transmitted from a floating HAARP system like the floating Sea-Based X-Band Radar platform that can be moved anywhere in the Pacific or Atlantic ocean under the protection of a carrier strike group—like the USS Ronald Reagan. Is this evidence or just a bunch of nonsense attached to a baseless conspiracy theory and recklessly made public by a crackpot? The above image is of the HAARP Sea-Based X-Band Radar (SBX) platform which does exist—not a conspiracy theory. The preceding link is to the United States Navy website. 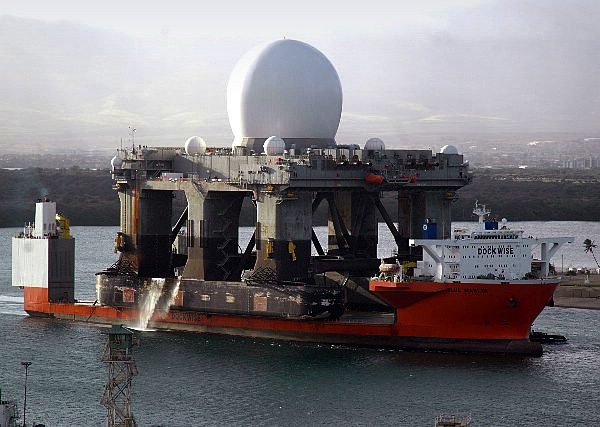 What is sitting on top of the deck of the SBX is a phased array antenna – a key component of the Missile Defense Agency (MDA) GMD system – clearly not a conspiracy theory. Even World renowned Stanford University knows about and publishes reports on the activities at the HAARP installations. According to Stanford:“The High Frequency Active Auroral Research Program HAARP) facility is located in Gakona, Alaska at 62.39º N, 145.15º W, near mile 11 of the Tok Cutoff Highway. The facility houses many diagnostic instruments for studying the ionosphere, but the highlight is the HF transmitter array. 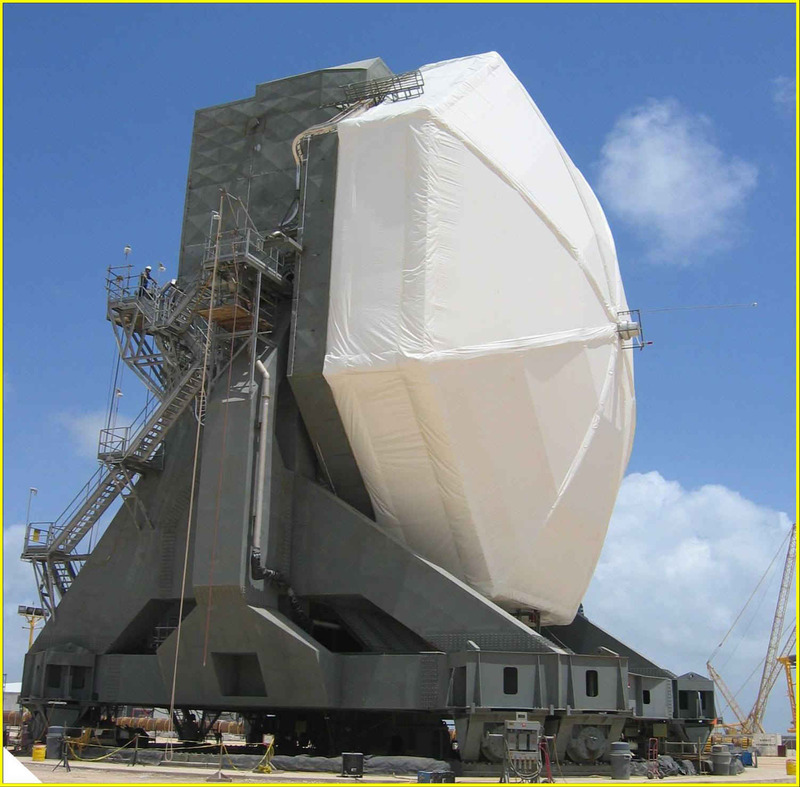 This array consists of 15×12 crossed dipole antennas, which together can transmit a total of 3600kW of RF power at frequencies from 2.8 – 10 MHz (HF, high frequency range). This power is partially absorbed by the ionosphere, and though only a tiny fraction of the power it naturally receives from the sun, can still produce subtle changes that can be detected with sensitive instruments.